A new app released on the Google Play Store allows Galaxy S10 owners to download wallpapers that hide the camera cutout from a single location. The app’s called Hidey Hole and it basically grabs cutout wallpapers published on a Reddit thread to make it easier for Galaxy S10e, S10, and S10+ owners to check the wallpapers out. 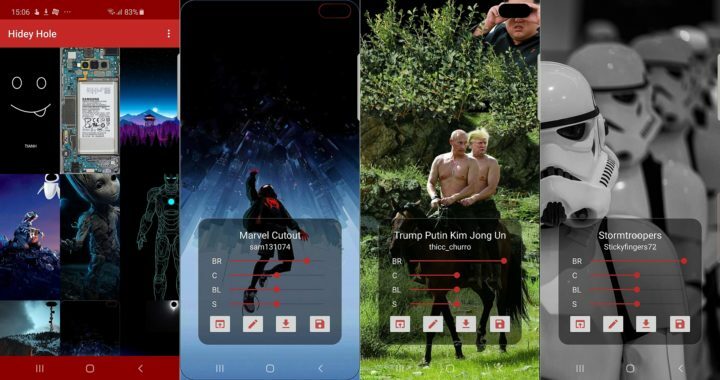 While the wallpapers come from Reddit, the developer of the app has added some excellent customization options that you can use to modify a wallpaper before applying it on your home or lock screen. The most useful option is the ability to increase or reduce the brightness of a wallpaper. Anyone who changes wallpapers regularly is aware of how some wallpapers can overshadow the text and icons on the home screen and make them hard to read/notice, and the brightness slider in Hidey Hole allows you to customize just how bright a wallpaper will be before you apply it. Wallpapers can be sorted by category and by device (S10e, S10, or S10+), and the app also has a link to the Reddit thread from which the wallpapers are obtained. Every wallpaper can be applied directly from the app or saved to your device, and new wallpapers are added every hour so you shouldn’t see yourself running out of choices anytime soon. The best part is that these wallpapers are free, unlike the ones Samsung is offering in the Galaxy Themes store. Do keep in mind that you will need to disable the Motion effect setting when applying any of these wallpapers or they will not properly wrap around the display cutout. Download Hidey Hole from the Play Store here. It will work on S9 ? I have the virtual bezel turned on and I won’t be switching it off under any circumstances BUT I have to say the creativity around how to hide the hole is inspiring. We never saw this level of engagement to try to hide hideous notches. Yeah, the fact that it’s a circle is pretty much the reason why all this creativity is coming up, easy to just turn them into eyes. Those notches are too wide for such wallpapers.